Business blogging has been around for a while and is a top priority for most marketers today. Your company blog can be a way to accomplish multiple objectives at once i.e. regularly publish useful content, enhance your SEO and showcase your thought-leadership. It has its benefits too — Companies that blog have 55% more website visitors, 97% more inbound links, and 434% more indexed pages. 57% of businesses have also managed to acquire a customer through their company blog! (source: hubspot.com). It’s not easy though. While marketers do understand the importance of blogging, many find it difficult and time-consuming. Also with most companies not having a dedicated blogger or content writer, the onus falls upon marketers that already have their plates full! Fortunately, there are a multitude of tools that can help Marketers blog better and stay productive. Here’s my pick of the top tools every marketer needs to use to kickstart their business blog. Ideation: Having a bank of post ideas is half the work done. Setting aside time everyday to add to your editorial calendar is a surefire way to stay on track with your content marketing plan. Here are a few tools to find & document post ideas. InboxQ: InboxQ is a great tool that allows you to see questions people are asking on Twitter using certain keywords. It’s a great source for understanding what your readers or users really want to know and definitely top of my list for gaining insights about Informative post ideas. Pocket: If, like me, you find inspiration for posts when you come across great articles, you can use Pocket for saving the articles you wish to refer to later. Using tags can help you filter them and make sure you don’t forget a great idea. Obviously, any read it later tool can do this for you — Pocket is just my personal favourite. IFTTT: IFTTT is one of the neatest services to come about in recent times and helps create ‘recipes’ to do the dull work for you. For instance, if you come across an interesting article and you favourite it with pocket, IFTTT can automatically add it to your Evernote notebook for post ideas. 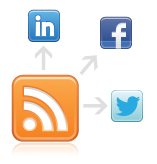 There are also a bunch of other recipes that can automate sharing on social streams, backing up of posts and more. Editorial Calender: Having an editorial calendar in place is pretty much a must-do for any blogger. It helps you plan your content marketing strategy and makes sure you’re regular. Here are a few ways you can manage your editorial calendar. Excel Template: Definitely a simple option for managing your editorial calendar. There are a bunch of ready-made templates available online that you can use. The best ones I’ve come across so far are Hubspot’s and the one by Bob Angus. Projectflowapp: If you’re more of a visual kind of person, a project tracking app like Projectflowapp can work brilliantly as an editorial calendar. I’ve used this tool in the past and I have to say it makes planning your blog posts a breeze! Task Management tools: Now if you’re part of a larger team where more than one person contributes to your company’s blog, using a task management app can make things a lot easier.For instance, with Brightpod, you can add a project for your editorial calendar with topics as the tasks. You can then go ahead and assign people, add due dates, collaborate using messages etc. Alternatively, you can use the same approach in any of the task management tools your team is currently using. 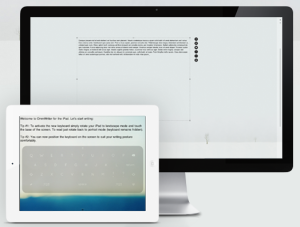 iA Writer: iA Writer is a brilliant tool for iOS devices that lets you focus just on your writing. It minimizes distractions and even has a focus feature if you’re working on a particularly difficult point in your post. Ommwriter: Ommwriter is an app for Windows & Mac that also allows the user to focus on their writing. It has some great options for ambient background music which helps writers really dive headfirst into their writing. 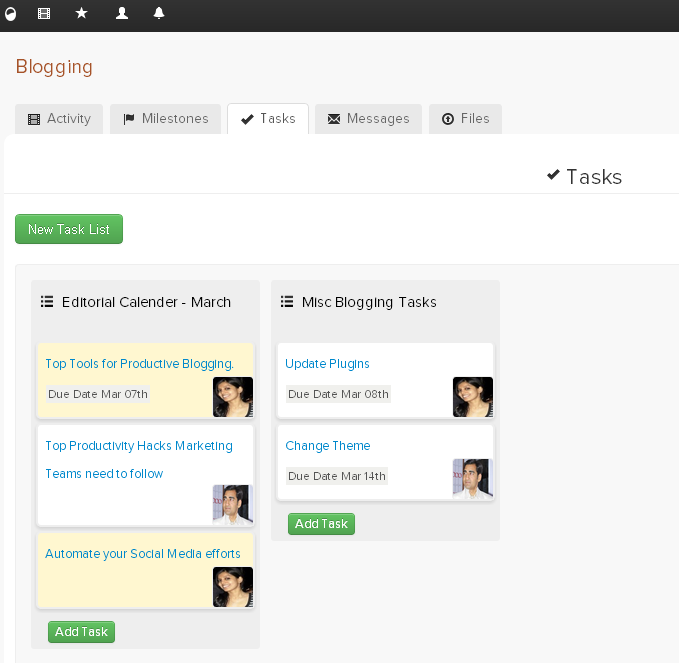 Your Blogging Platform:You can even use the default editor of Wordpress, Tumblr or Blogger to draft your posts. This gives you the added ability to save your drafts and allow another user/manager to edit and approve them. Blogjet:A native Windows app, Blogjet is a fully functional blog editor. With a great WYSIWYG editor and multi-platform support, it works well for most needs and can help you get your writing done without the hassles. Draft: Draft is a super app that let’s writers draft their posts and share it with others. Each user can edit their own version and all the different versions can then be merged by the writer/blogger. It’s quick & simple and gets rid of approval bottlenecks with ease. Collaboration Tools: Like I mentioned before, using a task management or collaboration tool can also help the entire team stay on the same page. If the content director at your company needs to approve a post or collaborate with you about your post, he/she can do it easily with most such tools. Scheduling & Sharing: Finally, the last piece of the puzzle is pushing out your content to the right social networks and increasing your blog traffic. After all, what’s the point of all this effort if nobody is reading your content?Here are a couple of tools that can help you schedule & share your posts. Blogging Platforms — Schedule Posts for later: All major blogging platforms allow you to schedule your posts for later so you don’t have to be around when you actually need to publish a post. This saves a lot of time and just helps you put all your finished blogs in the queue while you catch up with some other digital marketing tasks. Twitterfeed is a great tool that automatically pushes out updates about your latest blog posts to popular social networks like Facebook, Twitter & Linkedin. It’s pretty simple to setup and works like a charm. So there you have it! 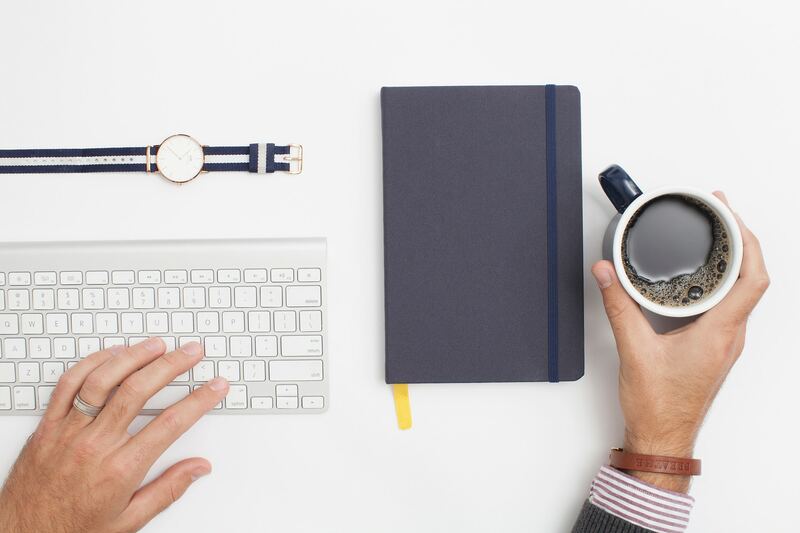 Our top tools for productive business blogging. 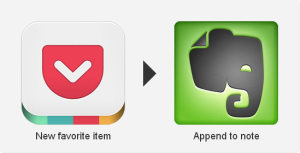 Have you come across any other tools that help you save time & be productive? Let us know in the comments!